A jaw dropping and altogether immaculate representation of a highly elusive and hotly desired production. 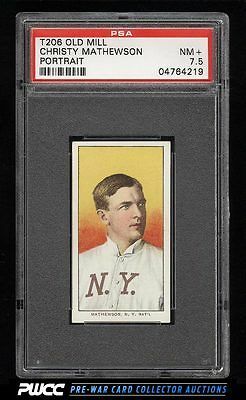 Felt by some to be the single most attractive T206 ever made, the Christy Mathewson Portrait resides in a special place among the hearts of avid T206 enthusiasts. Offered here is the single finest copy we've brokered in our history, boasting many attributes of a NM-MT card and featuring a relatively scarce Old Mill brand back to boot! Almost dead centered with pack fresh surfaces and bright white borders throughout. Few cards elevate a collectors heartbeat quite like this offering. We are proud to present this world-class investment piece to the eBay community, free of reserve or any other restriction. This comes with our highest recommendation. Part of a tremendous assembly of T206's on the auction block this month. One of nearly 17,000 cards, lots, and sets up for bid in our 8th Auction of 2016. Click on the link above to view the other PWCC auction lots.